Benefits: This herb is considered one of the best depuratives and is used for skin disorders (in particular eczema – the dry kinds, psoriasis and other chronic skin disorders and boils). Any disorders requiring increased elimination from the body such as gout and rheumatism. Skin eruptions are indicated especially where weak circulation and impaired nutrition exist. Hence it is also used in anorexia nervosa and dyspepsia. Considered an excellent blood purifier which is why it is used to treat many skin conditions and diseases. It is also used as a wash for ulcers, a poultice for boils, scurvy and rheumatism. 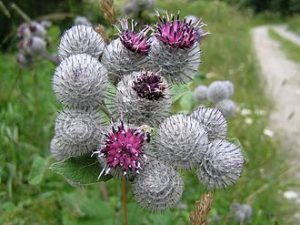 Burdock is used to cleanse the lymphatic system and kidneys. Active Constituents: Flavanoid glycosides, bitter clycosides, alkaloid, anti-microbial substances. The seeds contain chemicals insulin, mucilage, sugar and tannic acid along with crystalline glucodise lapoin. Pharmacological Actions: Alterative, diuretic, bitter, tonic, diaphoretic.